Father’s Day is a day to celebrate our fathers and grandfathers too. Grandpas were dads before they got promoted to being grandparents. If you would love to show grandpa how much he means to you on Father’s Day, why not give him a gift to tell him how much you appreciate and care for him. If you are still searching for the perfect gift for grandpa, consider getting him one of our suggestions below. If you love grandpa, don’t be afraid to tell him. Make grandpa feel loved and special on Father’s Day through this glass block which is adorably designed to showcase your love for him. This glass block can be personalized with any title up to 10 characters on one side and up to 20 names with up to 10 characters each printed in a repeating manner. You can include all the names of grandpop’s grand children to remind him how many little angels adore him altogether. This glass block measures 4 inches by 5 and ¾ which makes a charming paper weight or a beautiful table piece on grandpa’s desk or favorite coffee table. Celebrate Father’s Day with one of the coolest dad you have ever known and that would be grandpa. His youth may have passed him by but his coolness and giggliest never did. Show grandpop how cool he is and how his new role as a grandparent is an achievement. Like what this cool shirt says, only great dads are promoted to grandpa. He must have been that great to be promoted. This shirt is not only fun to look at but it’s also nice to wear since it is made from 6.0 oz pre shrunk 100% cotton. It is very comfortable, loose fitting and wears well on anyone. It is also designed to withstand long periods of time since it has double stitched sleeve hems and bottom. With different colors and sizes to choose from, for sure you’ll get grandpa’s pick. On Father’s Day, surprise grandpa with a charming gift that will show his evolution through time. This would be a beautiful family keepsake that will be cherished throughout the generations. 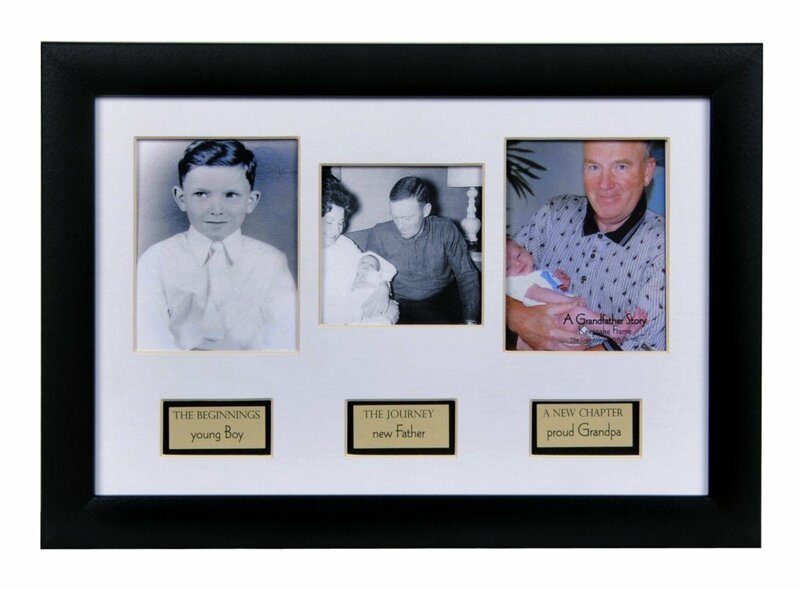 This frame features three photos of granddad through time added with lovely captions per photo. Summarize how great grandpa lived through the different milestones he has accomplished. It measures 8 by 12 inches in black wall frame that would be a perfect addition to grandpa’s favorite spot in the home or in his office. You can also include your special message and engrave them in an optional plaque included. For sure, granddad will be overwhelmed and would love you more for this wonderful gift. 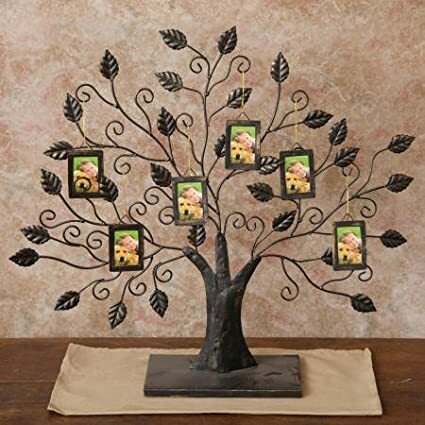 Show grandpa a surprise that will fill his heart with joy on Father’s Day by gifting him this one of a kind family tree. This family tree is a gorgeous accent to grandpa’s room. It measures 23 inches by 19 and includes 6 frame ornaments which may bear all the beautiful grandchildren of our favorite grandpop. It is very easy to assemble; even a kid can put it together. The charming and elaborate design of the leaves and the trunk makes it look elegant and more sentimental to look at. Grandpa will definitely love this family keepsake and will surely treasure it for more years to come. If grandpa likes to take the time, why not gift him the gift of time in style? This elegant pocket watch is a handsome addition to his watch collection. It is crafted in stainless steel with a brushed pewter finish and a white numeric face. It is a classic watch which is perfect for the classic yet stylish grandpa. It can be personalized with up to three letter monogram which is engraved with a raised middle initial. Watch measures 1 and ¾ inches in diameter and its removable chain measures 12 inches in length. Grandpa can now keep the time in a fashionable and classical way through this beautiful pocket watch. Grandpa’s favorite past time is golf. If he loves to play golf then a gift that he could use during his favorite past time would be much appreciated. This personalized golf towel is of high quality materials. It is made from 100% cotton and features a sheered terry on one side and a distinctive graphic woven right in. It has an inch of grommet with hook so that grandpa can easily clip it to his golf bag. You can even personalize this golf towel with up to 12 characters. It measures 20 inches by 24 and the towel reads “where the ball is hit hard, straight and not too often”, grandpa will absolutely get what it meant if you didn’t. If you want to enhance granddad’s golf skills then why not gift him a golf lesson with a PGA pro on Father’s Day? It is a personalized lesson plan under the supervision of a class A PGA professional. The teacher will look at the key elements of the golf game to help grandpa’s game and improve his shot. He will absolutely lower his handicap once he learned a thing or two from this golf lesson. Grandpa will surely be thankful for this gift because he will learn lifelong skills in golf in just one lesson! He could develop more confidence and enjoy his favorite past time more once you have given him this perfect gift. Grandfathers are special and no matter how old they get they would surely be the special person whom we looked up to since we were kids. On Father’s Day, don’t be shy to show him how much you love him and how special he is to you. Grandpa will fell loved and appreciated by you the more once you have given him any of the aforementioned gift ideas above.